The average man has approximately six litres of blood in his body. This blood is carried by several different types of blood vessels, each of which are specialised to play their role in circulating blood around the body. There are three major types of vessels; arteries, veins and capillaries. Arteries (with the exception of the pulmonary artery) deliver oxygenated blood to the tissues. At the tissues, the oxygen and nutrient exchange is carried out by the capillaries. The capillaries also return deoxygenated blood to the veins, which bring it back to the heart (with the exception of the pulmonary veins). Fig 1.0 – Overview of the vessels involved in blood circulation. In this article, we shall follow the path that blood takes around the body, examining the structure and function of the major types of blood vessels. Vessel walls can largely be split into three sections; tunica intima (innermost), tunica media, and tunica adventitia. Each must be considered. As a whole, the arterial system takes oxygenated blood from the heart, and delivers it to the capillaries, where oxygen and nutrient exchange can occur. There are four main types of artery in the body, each with a distinct structure and function. We shall look at each in more detail (in order of decreasing size). Fig 1.1 – The components of an artery wall. These are the largest arteries found in the body, and are found closest to the heart. They function to ‘conduct’ blood from the heart to regions of the body, where it can be distributed. Elastic arteries include most of the named vessels surrounding the heart, such as the aorta and pulmonary arteries. Tunica Intima: Endothelial cells with a thin subendothelium of connective tissue and discontinuous elastic laminae. Tunica Media: The tunica media is comprised of 40-70 fenestrated elastic membranes with smooth muscle cells and collagen between these lamellae. It is the thickest part of an elastic artery. From the large elastic arteries, blood enters smaller distributing arteries. They distribute the blood to sub-regions of the body. Medium muscular arteries are similar in structure to large elastic arteries. Tunica Intima: Consists of an endothelium, a subendothelial layer and a thick elastic lamina. Tunica Media: Consists of around 40 layers of smooth muscle connected by gap junctions in order to allow coordinated contraction. Tunica Adventitia: Thin layer of connective tissue containing minor vasa vasorum, lymphatics and nerve fibres. Arterioles are part of the microcirculation. They carry blood from the muscular arteries to the metarterioles. Arteries with a diameter of less than 0.1mm are classed as arterioles. They generally have around 3 layers of smooth muscle cells and the internal elastic lamina is absent. The external elastic lamina is only present in larger arterioles. Arteries that supply capillary beds are known as metarterioles. Instead of having a continuous layer of smooth muscle cells, intermediate rings of smooth muscle are located at certain points. These rings are known as known as precapillary sphincters, which contract to control blood flow to the capillary bed. Precapillary sphincters are very important in the control of tissue perfusion. When the body performs certain actions, these structures are able to restrict blood flow to certain regions and encourage it to others. For example, when running, skeletal muscle requires a lot more blood than it usually would. In order to accommodate for this, precapillary sphincters in skeletal muscle relax in order to increase blood flow. Capillaries consist of one layer of endothelium and its concordant basement membrane. They are specially adapted to provide a short diffusion distance for nutrient and gaseous exchange with the tissues they supply. There are three types of capillaries; continuous, fenestrated and sinusoidal, each of which have variably sized gaps between the endothelial cells. These gaps act as a sieve, controlling which molecules and structures can leave the capillary. For example, in continuous capillaries (located in skeletal muscle), only water and certain ions can leave. In sinusoidal capillaries (located in the liver), larger structures such as cells and proteins are able to exit. Fig 1.2 – The three different types of capillary. As a whole, the venous system takes deoxygenated blood from the capillaries, and delivers it to the heart (with the exception of the pulmonary veins). From the heart, blood can be pumped to the lungs and re-oxygenated. 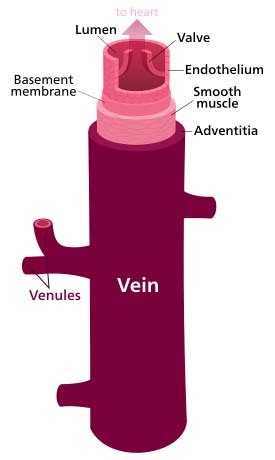 Like the arterial system, the venous system is comprised of different vessel structures. We shall look at each in more detail (in order of ascending size, as we move away from the capillaries). A postcapillary venule receives blood from capillaries and empties into venules. In addition, the surrounding tissue fluid tends to drain into them, as their pressure is lower than that of capillaries or the tissue. The wall is an endothelial lining with associated pericytes and a diameter of 10-30 micrometres. This is similar to the structure of capillaries, but postcapillary venules are more permeable, making them the preferred site of white blood cell migration (e.g. to sites of infection). During inflammation pressure in the venules actually becomes higher than that of the surrounding interstitium. This allows fluid to leak into the site of inflammation along with inflammatory cytokines and white blood cells. Venules are continuous with the post-capillary venules. They continue to move blood away from the capillary beds. Many venules unite to form a vein. The endothelium is associated with pericytes or thin smooth muscle cells (the beginning of a tunica media) to form a very thin wall. Venules can have a diameter of up to 1mm. They also contain valves that press together to restrict retrograde transport of blood. Veins are the major vessels of the venous system. They are the final step in the return of blood to the heart. Fig 1.3 – Structure of a vein wall. Veins generally have a larger diameter and a thinner wall than the accompanying artery. The vessel wall contains more connective tissue, with less elastic and muscle fibres. Small and medium veins have a well developed tunica adventitia and a thin tunica intima and media. Large veins have diameters greater than 10mm and a thicker tunica intima. They have well developed longitudinal smooth muscle in the tunica adventitia. The media has circular smooth muscle, which is usually not prominent, except for the superficial veins of the legs. Veins contain valves that primarily prevent the back-flow of blood. They also act together with muscle contraction, squeezing the veins to propel blood towards the heart. Venae comitantes are deep paired veins wrapped together with an artery in one sheath. The pulsations of the artery promote venous return within the paired veins. Which of the following has the smallest diameter? Which of the following do capillaries drain into? Which of the following describes deep paired veins accompanied by an artery?